The New England Patriots become the first team in Super Bowl history to trail by double digits in the second half and win Super Bowl XLIX at the University of Phoenix Stadium, Glendale, Arizona. The Patriots took the lead from the Seattle Seahawks with two minutes left and held on for a 28-24 victory. Patriots quarterback Tom Brady, who completed a Super Bowl record 37 of 50 passes for 328 yards and four touchdowns, with two interceptions, was named Super Bowl MVP. The half-time show was fronted by Katy Perry, Lenny Kravitz and Missy Elliot. Novak Djokovic wins his fifth Australian Open, beating Andy Murray 7-6, 6-7, 6-3, 6-0. Andy Murray’s fiancee Kim Sears laughed off the controversy over her colourful language caught on camera during Murray’s semi-final against Tomas Berdych on January 29th 2015 in Melbourne by wearing a ‘Parental Advisory: Explicit Content’ t-shirt at the Australian Open final. Democratic Republic of Congo footballer Gabriel Zakuani is run into by the stretcher buggy during his team’s semi final against Congo in the Africa Cup of Nations. The defender was already injured when the buggy hit him. DR Congo went on to win 4-2 without Zakuani who also plays for Peterborough United in the UK, but he was not badly hurt. A hardman in the 90s, Batty’s tough guy reputation took a knock when his three-year-old daughter ran over his foot with a tricycle when he was recovering from an ankle ligament injury. During the warm-up for Bayern Munich’s game against Arminia Bielefeld, Rensing hit a strike so hard it gave number one Kahn a black eye. 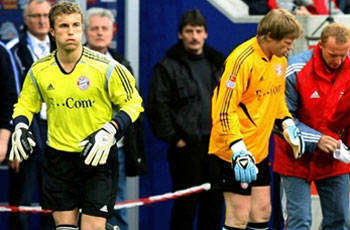 The Bayern shot stopper was forced to give up his place to his deputy but it didn’t make much difference as the Bavarians ran out winners. All four players suffered injuries stretching for the ‘zapper’. Keane and Cudicini hurt their knees while Calamity James pulled a muscle in his back as he jostled with the remote. Seaman pulled a muscle as he tried to record British soap Coronation Street. He also put his shoulder out trying to reel in a giant fish. The Dutchman was desperate to leave Hamburg for Valencia in 2007 and pulled out of a European game so he wouldn’t be cup-tied. His lame excuse? Lifting his one-year-old son. Nobody bought it and the saga was dubbed ‘Van der Farce’ by the German media. Former England striker Vassell picked up an infection and had to have a portion of his nail removed after attempting to drain a blood blister on his foot with a power drill. He finally saw sense and sought proper medical attention after realising he wasn’t a surgeon. Tough Argentinian Arca was stung by an exotic jellyfish when he went swimming in England’s north east during a Sunderland team training session. He broke out in a severe rash and was rushed to hospital. Rumours that the jellyfish was a Newcastle fan remain unconfirmed. All set to be West Germany’s number one for the European Championships, the shot stopper went out to celebrate with his fiancee. After the meal he tried to stand up and shrieked in pain after tearing his meniscus and locked his knee. Harold Schumacher took over and just to rub it in West Germany went and won the tournament. Forget Golden Balls, Scottish player Kevin Kyle was christened ‘Scaldin Balls’ after injuring his private parts with a jug of boiling water. The proud dad was warming up a bottle of milk for his new son when the toddler slipped and hit the jug in Kyle’s direction, inflicting burns to his testicles and inner thigh. The then Premier League player missed his club’s next game and a Sunderland spokesperson said he was walking like John Wayne for a few days! Brentford goalkeeper Brodie collided with a sheepdog which raced onto the pitch. The dog got the ball while Brodie shattered his knee cap and never played again. “The dog might have been a small one, but it just happened to be a solid one,” he said years later. 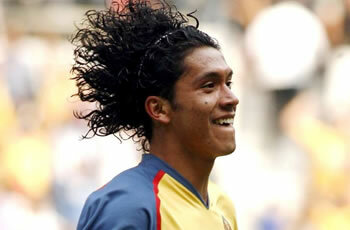 Silva was the second Club America star to be shot in a week after team-mate Salvador Cabanas amazingly survived a gunshot wound to the head. The Mexican was a victim of gunfire after being shot during a carjacking. “He was shot in the gluteus, but the bullet went in and came out, which did not cause major damage,” said Edwin Victoria, Club America’s press officer. Talented Italian Ivano Bonetti fell ‘fowl’ of coach Brian Laws after Grimsby Town lost 3-2 to Luton. During a demonstrative team talk Laws aimed a plate of chicken wings at Bonetti, who was left with a fractured cheekbone. 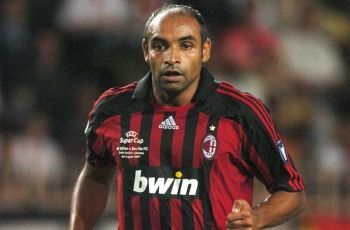 Had he not being playing the clown, Emerson – and not Cafu – would have lifted the World Cup in 2002. Instead the midfielder missed the tournament after dislocating his shoulder after volunteering to play in goal and strained himself trying to save a Rivaldo shot. Norwegian international Grondalen was forced to miss a game for his country after being the victim of a hit and run with a stray moose when he was out on his morning run. Brazilian player Ramalho was laid up in bed for three days after swallowing a giant pill he had been prescribed for a dental infection. Unfortunately for the player it was supposed to be administered anally. Modern footballers are used to the jet-set lifestyle. Erm… not quite, as former Hajduk Split stalwart Milan Rapaic missed the start of the Croatian season after sticking his boarding pass into his eye at the airport. Becks was given the boot out of Old Trafford by Sir Alex Ferguson after the Reds limped out of the FA Cup against Arsenal in 2003. Fergie flipped after the game and kicked a stray boot which caused a cut just above the then England captain’s eye. Refusing to apologise, the Manchester United boss quipped: “If I tried it 100 or a million times it couldn’t happen again. If I could, I would have carried on playing!” Becks was booted out for good a few months later to Real Madrid. Brazilian legend Ronaldo expected some rough treatment when he returned home. Trouble was it happened off the pitch too as he was left with a black eye after being struck by a microphone during a media scrum following his debut for Corinthians. Along with Emerson, World Cup 2002 was a vintage year for freak injuries. 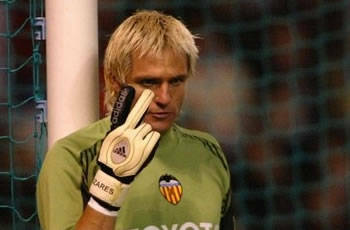 Spain’s number one shot stopper Canizares was forced to watch Iker Casillas take his place after accidentally smashing a bottle of aftershave and a shard of glass severed a tendon in his big toe. 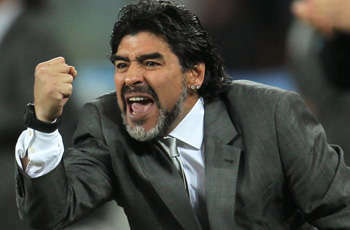 If you’re wondering why Diego Maradona was sporting a Fidel Castro-style beard this summer you can blame his dog. The former Argentina coach was attacked by his beloved Shar Pei pet, who bit the great No. 10 on the face. El Diego had to undergo surgery and receive tetanus and rabies vaccines. Newly wedded bliss and celebrating a goal is the ultimate combination surely. Not so for ex-Servette player Paulo Diogo, who ran into the joyous crowd to lap up a goal against Schaffhausen only to catch his wedding ring on a fence and rip off the top half of his finger. With Diogo writhing in agony, the match had to be temporarily stopped as stewards looked frantically for the remaining part of his finger. The unsympathetic referee promptly booked Diogo for celebrating too wildly! Things didn’t get any better back at the hospital when surgeons were unable to re-attach the finger and advised the player to amputate the rest of it. Ouch!